The company’s report: ‘H1 2019 Global Petrochemicals Capacity and Capital Expenditure Outlook – Asia and the Middle East to Lead Global Petrochemical Capacity Additions’ reveals that around 1,320 planned and announced plants are scheduled to come online, predominantly in Asia and the Middle East. Within Asia, China plans to add a total capacity of approximately 152.4 million tonnes per annum (mtpa) with the help of 305 planned and announced petrochemical plants. The country is expected to spend a capital expenditure (capex) of US$91.5bn during the period. Hengli Petrochemical and China Petrochemical Corp are the top two companies accounting for the major capacity additions in China. GlobalData identifies the Middle East as the second largest region in terms of capacity additions. Iran will have 152 planned and announced petrochemical plants, adding capacity of around 73.3 mtpa by 2030. The country is expected to spend a total of US$51.1bn. The National Petrochemical Co, Badr-e-Shargh Petrochemical Co and Sepehr Makran Iran are the top companies accounting for the major capacity additions in Iran. 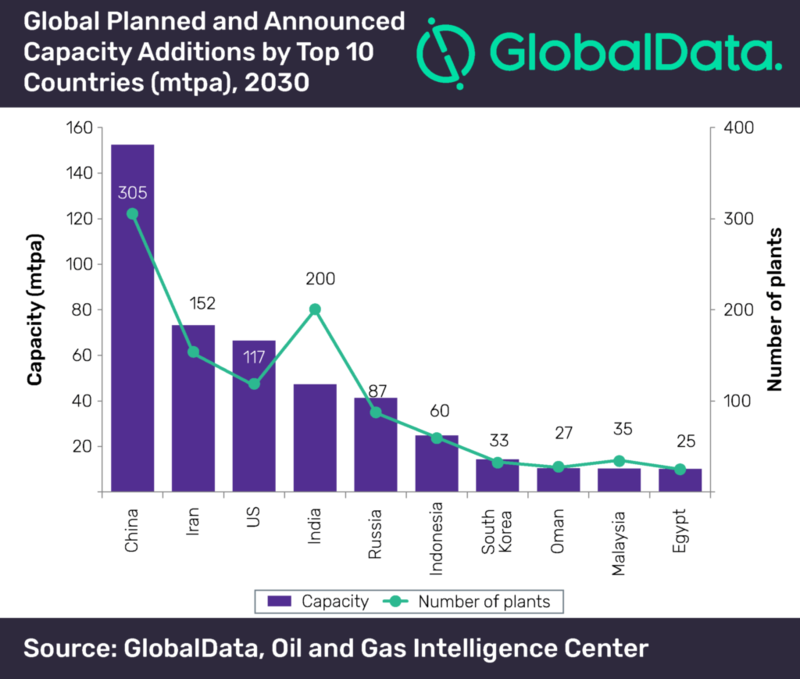 In North America, the majority of capacity additions will be from the US, with planned and announced capacity additions of roughly 66.4 mtpa by 2030 and it is expected to spend a capex of around US$61.6bn. Major capacity additions will be from Formosa Plastics Group, IGP Methanol LLC and NW Innovation Works Inc. In the Former Soviet Union (FSU), the majority of capacity additions will be from Russia, with planned and announced capacity additions of about 41.2 mtpa by 2030. Capex for these plants totals US$39.8bn. Sibur Holding and Rosneft Oil Co are the top companies accounting for the major capacity additions in Russia. In Africa, majority of the petrochemical capacity additions are in Egypt, with planned and announced capacity additions of about 10.1 mtpa. Capex for these plants totals US$11.7bn in the coming years. In Europe, Belgium plans to spend US$1.6bn to add capacity of approximately 1.9 mtpa, which is expected to come onstream by 2030. In South America, Brazil plans to spend US$9.6bn in the coming years to add capacity of 8.7 mtpa.